With our own knowledge levels being so limited, so imperfect, and so incomplete, we all should desire the gift of knowledge from the Lord so that we can make it through this life in one piece and in peace and get to where we need to go in our divine destinies with God. Spiritual gifts come from God for a special purpose. 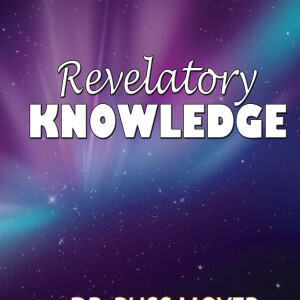 In the list that Apostle Paul gives are gifts directly related to Revelation. Knowledge, Wisdom and Discernment are referred to as revelatory because they reveal facts of private life and different types of spirits. * speaking with such a knowledge and insight, that it must be said that it was supernatural, given by God and could not have been thought of by the human mind. * A word of knowledge is a definite conviction, impression, or knowing that comes to you in a similitude (a mental picture), a dream, through a vision, or by a Scripture that is quickened in you. * It is supernatural insight or understanding of circumstances, situations, problems, or a body of facts by revelation; that is, without assistance by any human resource but solely by divine intervention. * Furthermore, the gift of the word of knowledge is the transcendental (awe-inspiring) revelation of the divine will and plan of God. It involves moral wisdom for right living and relationships, requires objective understanding concerning divine things in human duties, and refers to knowledge of God or of the things that belong to God, as related in the Gospel. The gifts of the word of wisdom and the word of knowledge function together; knowledge is raw material and wisdom builds on it. This spiritual knowledge is in harmony with the scriptures, true, factual, trustworthy and pure. These utterances have usually to do with human matters or problems. Examples: Exodus 31:3; 35:31; 1 Kings 7:14; 2 Chronicles 1:10-13; Isaiah 11:2; Daniel 5:12. Apostle Paul was not referring to natural knowledge, that was built up through or gained through learning and experience and not even to instinctive knowledge. He is speaking of knowledge of which it must be said that it could only be known and derived by divine inspiration. This gift is one that you should desire to be manifested in your daily life with the Lord. With God having absolute perfect knowledge on all things, and with us having knowledge levels that are completely imperfect and limited, this means that we all need to receive words of knowledge from the Lord on a very regular and frequent basis in order to be able to safely navigate our journey through this life. 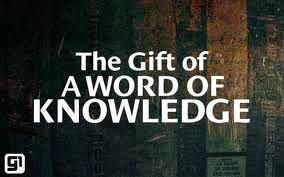 The gift of knowledge is simply the Holy Spirit transmitting His specific knowledge to you on something that you would have no ability or means to be able to know about with your own limited intelligence and knowledge levels. It is supernatural knowledge and insight being given directly to you by the Holy Spirit Himself, not by your own mind or your own intelligence levels. The words of knowledge that you receive direct from the Holy Spirit can literally cover an infinite number of things. They can cover anything from something very trivial such as where you may have misplaced your car keys, to giving life-saving knowledge on how to solve an impending crisis or emergency. 1. How to settle or resolve an aught against another member in the body of Christ. 2. How to solve a specific problem at your place of employment. 3. Knowledge on what a certain Scripture verse may mean and how it can apply to your own personal life. 4. How to properly witness to an unsaved family member, friend or stranger. 5. How to solve a marital dispute. 6. How to start up a new business. 7. Where to look for that next new job if you have just been laid off. 8. Who God wants you to marry in this life. 9. How to counsel someone who has just had an impending tragedy hit them full force. 10. What your specific calling in the Lord is going to be in this life. As you can see from these kinds of examples, there is literally nothing that the Holy Spirit cannot give a word of knowledge on how to properly handle something. How exactly does the Holy Spirit transmit an actual Word of Knowledge to us? Though God can community to us in a variety of ways, most often He will communicate a Word of Knowledge to us through the inner knowing (deposit or download) from God. The Bible says that the Holy Spirit will bear “witness” with our human spirits. This inner witness is what is referred to as inner knowing. All of a sudden, you will receive a without-a-doubt type knowing on the knowledge that God transmits to you. It can come in the form of a thought or an impression on your mind, or possibly come in the form of a vision or a picture in your mind’s eye. The Holy Spirit communicates knowledge through these pictures, which are really visions in your mind’s eye. These pictures can be used to give you quite a bit of information and knowledge on what He is relaying to you. It is said a picture is worth a thousand words, and sometimes much more information and knowledge can be conveyed to you by way of a simple picture rather than words or sentences, depending on exactly what you are dealing with. The only problem with these pictures in your mind’s eye is that you have to learn how to discern the difference between when a vision is coming from the Holy Spirit and when a vision is coming in from your own natural imagination, as your own natural imagination has the power and the ability to conjure up their own mental pictures in your mind’s eyes. This is something that you will learn through the process of trial and error, staying prayerful and studying His word. The Bible tells us that “without knowledge” we perish and go into captivity in this life. And sometimes only the supernatural knowledge of God can help keep us out of harm’s way in this life, since our own knowledge and intelligence levels are so imperfect and so limited.